Indian Army Recruitment 2017-18 (Short Service Commissioned SSC) notification for 01 military nursing post. All legible and interested candidates can apply on or before (11-07-2017). Further information about the Indian Army registration, vacancy, courses and exams, salary details, careers, application fee, educational qualifications and all other details/information about this post is mentioned in detail below. 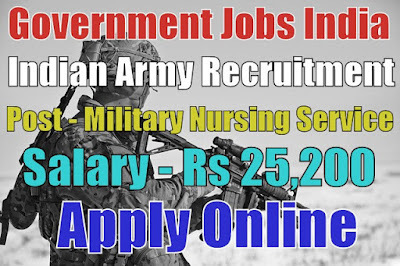 Salary/Pay and Grade Pay - For military nursing post, the payable salary will be Rs 15,600 with Rs 5,400 grade pay + Military Service pay Rs 4,200 grade pay. Further information about salary details is mentioned in the detailed advertisement. Age Limit - For Indian Army recruitment, candidate age should lie between 18 - 34 years. To know more about age details, click on the detailed advertisement. Educational Qualifications - Candidates have must done 10th (matriculation), 12th, a graduate degree, M.Sc (Nursing)/ PBBSc (Nursing)/ B.Sc (Nursing) or it's equivalent/relevant/higher qualification from a recognized board or university. To know more about educational qualification details, see the advertisement. If you are not graduated then, click here for 10th and 12th based jobs. Selection Method - For recruitment in the Indian Army, the candidate will be selected on the basis of their performance in written exam, medical test and then personal interview conducted by the committee. Candidates must be prepared for these tests.The candidate will be required to bring original and self-attested copies of mark-sheet, passing certificate, valid state registration certificate and other certificates as per eligibility criteria listed in the website at the time of interview. How to Apply - All legible and interested candidates have to apply online from official website www.joinindianarmy.nic.in or from the given link below. Candidates need to register themselves before applying online. Candidates need not send the application form via offline or by other means. Last Date for Submitting Application Form - All candidates must apply on or before (11-07-2017). After the last date, no application form will be submitted. Application Fee - There will be no application fee for any category candidates. Regular employees of Indian Army applying for the higher position are too not required to pay any application fee. Indian Air Force IAF recruitment 2017-18 Group Y Trades notification for Various Airmen posts. All legible and interested candidates can apply on or before (24-07-2017). 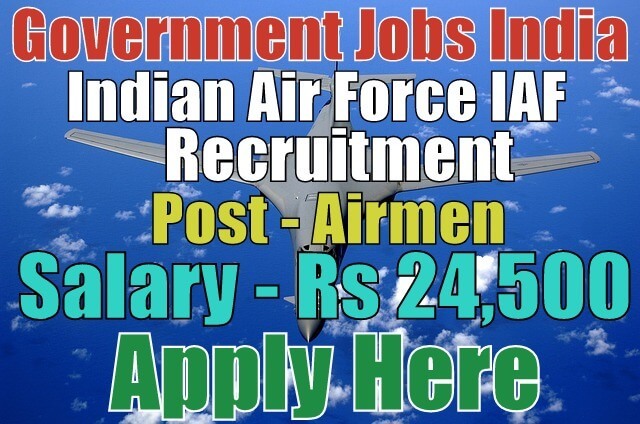 Further information about the Indian Air Force vacancy and exams, courses, salary details, IAF careers, sports quota jobs, application fee, educational qualifications and all other details/information about this post is mentioned in details below. Salary/Pay and Grade Pay - For Airmen post, the payable salary will be Rs 24,500 per month as per sixth pay commission depending upon the rank attained. Further information about salary details is mentioned in the detailed advertisement. Age Limit - For IAF recruitment, candidate age should lie between 23 - 27 years. To know more about age details, click on the detailed advertisement. 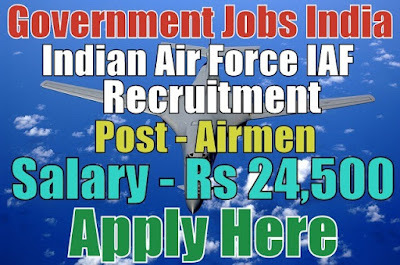 How to Apply - All legible and interested candidates have to download an application form from official website www.indianairforce.nic.in/ or from the given detailed advertisement. Candidates have to take a printout of application form. After printout, candidates must fill the application form and send the application form along with needed / relevant / required testimonials(which is mentioned in detailed advertisement) superscribing the envelope "Application for the post of 'Name of Post' " to the given desired address. Last Date for Submitting Application Form - All candidates must apply on or before (24-07-2017). After the last date, no application form will be submitted. 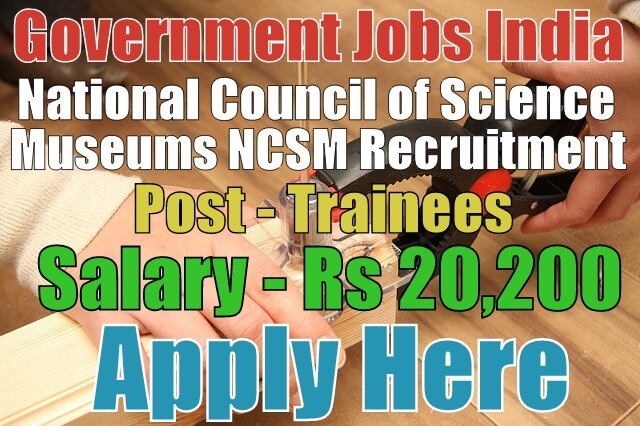 National Council of Science Museums NCSM Recruitment 2017-18 (Ministry of Culture) notification for 01 Technician post. All legible and interested candidates can apply on or before (08-07-2017). Further information about the National Council of Science Museums courses and exams, vacancies, salary details, NCSM jobs and careers, application fee, educational qualifications and all other details/information about this post is mentioned in details below. 1. Technician 'A' (Carpentry) - 01. Salary/Pay and Grade Pay - For manager and officer posts, the payable salary will be Rs 5,200 - 20,200 with Rs 1,900 grade pay. Further information about salary details is mentioned in the detailed advertisement. Age Limit - For NCSM recruitment, candidate age should be less than 35 years. To know more about age details, click on the detailed advertisement. Educational Qualifications - Candidates have must done 10th (matriculation), ITI or it's equivalent/relevant/higher qualification from a recognized board or university. To know more about educational qualification details, see the advertisement. If you are not graduated then, click here for 10th and 12th based jobs. Selection Method - For recruitment in the National Council of Science Museums, the candidate will be selected on the basis of their performance in the aptitude/trade test and then personal interview. Candidates must be prepared for these tests. How to Apply - All legible and interested candidates have to download an application form from official website http://bitm.gov.in/ or from the given link below. Last Date for Submitting Application Form - All candidates must apply on or before (08-07-2017). After the last date, no application form will be submitted. Application Fee - There will be no application fee for any category candidates. Regular employees of NCSM applying for the higher position are too not required to pay any application fee. 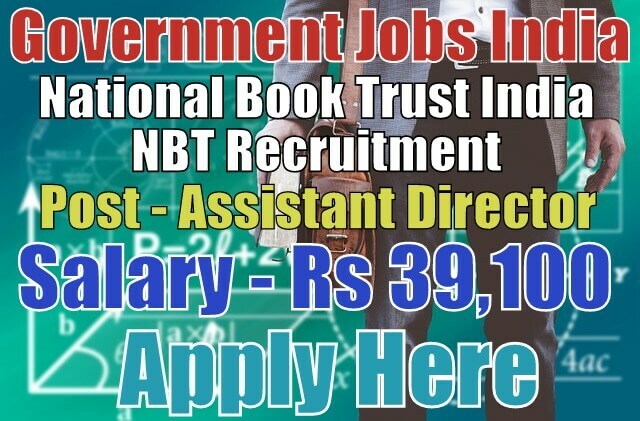 National Book Trust NBT Recruitment 2017-18 (Ministry of Human Resource Development) notification for 01 Assistant Director post. All legible and interested candidates can apply on or before (15-07-2017). 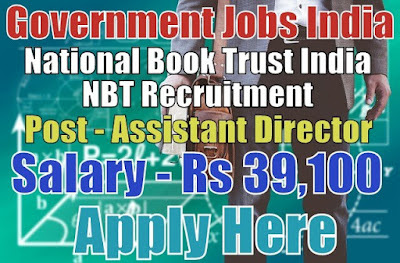 Further information about the National Book Trust courses and exams, vacancies, salary details, NBT India careers, application fee, educational qualifications and all other details/information about this post is mentioned in details below. 1. Assistant Director (Group 'A') - 01. Salary/Pay and Grade Pay - For assistant director post, the payable salary will be Rs 15,600 - 39,100 with Rs 5,400 grade pay. Further information about salary details is mentioned in the detailed advertisement. Age Limit - For NBT recruitment, candidate age should be less than 35 years. To know more about age details, click on the detailed advertisement. Work Experience - Candidates must have some work experience according to their educational fields. For more information about work experience required for this post, go through the detailed advertisement. How to Apply - All legible and interested candidates have to download an application form from official website www.nbtindia.gov.in or from the given link below. Candidates have to take a printout of application form. After printout, candidates must fill the application form and send the application form along with needed / relevant / required testimonials(which is mentioned in detailed advertisement) superscribing the envelope "Application for the post of 'Name of Post' " to the given desired address. Last Date for Submitting Application Form - All candidates must apply on or before (15-07-2017). After the last date, no application form will be submitted.